Surely, I said, we can do better than that. 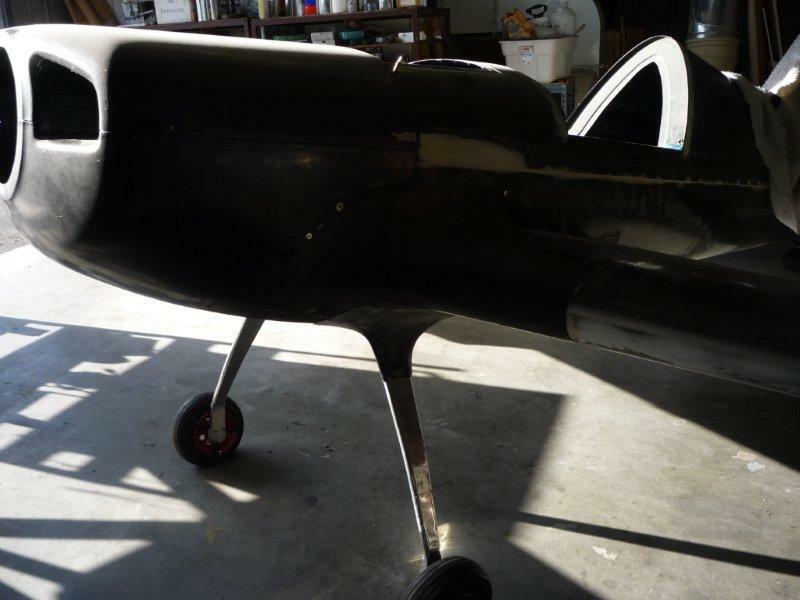 I’m tentatively scheduled to fly up there next week, once he has the engine hung on the mount. I’ll bring the FARO arm to digitize the firewall, spinner and engine. 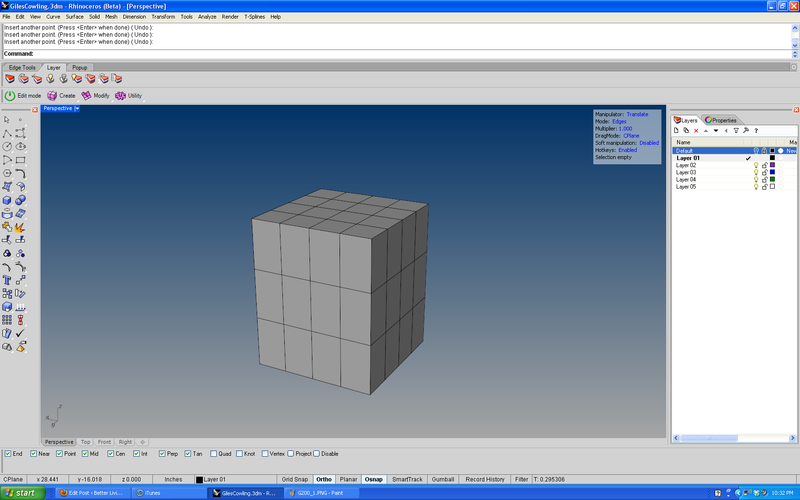 In the meantime, let’s get started on the surface model. Wait, what? You might be asking “how do you start a surface model when you haven’t even gotten the plane digitized?” Well, this is truly one of the places where T-Splines just blows my mind. Traditional NURBS modeling packages generate surfaces by taking input curves and surfaces and using those as input for a new surface. So if I was using standard Rhino, I would have to wait until after I digitized the plane to start. T-Splines on the other hand is topology based – meaning the way I define the entire surface and how the faces of that surface relate to each other is what allows me to generate the final surface. 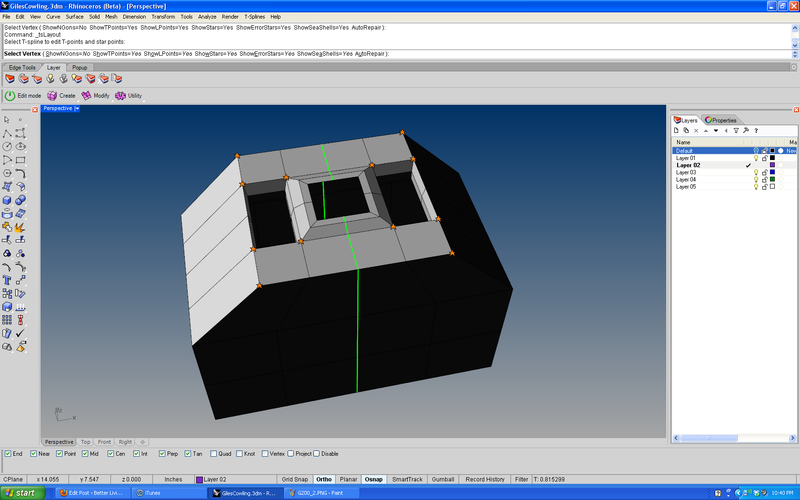 T-Splines surfaces are unified, so I can edit them at any time without affecting other parts of the model. So this means I can figure out HOW I want to model the spinner ring and inlets, without having to concern myself with the part of the cowl that mates to the fuselage. Once I get on site and have the relevant sections digitized, I can simply match my existing T-Spline surface to that geometry, and then style and tweak the model. They are all in areas of relatively low curvature, which helps greatly in keeping the model smooth. If I need to add more points to match the firewall, I can do that easily – in fact I can use the tsMatch command and it will insert extra points automatically if I need it to. Basically, the hard part of this job is done, and I haven’t even shown up yet to do the work! nicely done, keep it up! Sky, this is beautiful work. 1) positioned a NURBs cylinder in place of (and along the axis of) the spinner? 2) tsMatched the edge of the cylinder to the edge of the spinner cutout in the cowl? But there must be more to your method, since there is a circular flat, or washer shape, under the spinner. tsMatch works just as well with a curve for the matching object. Of course there is no surface tangency information in a curve, but for a spinner ring on a cowl like that that doesn’t matter. If, say, I was doing some Formula 1 aircraft cowl that had a nice long prop extension on the shaft, I would probably use tsMatch and match the cowl surface to the back of the spinner surface (the spinner surface being NURBS…..actually, now that I think about it, you can probably use tsMatch and use a T-Spline surface as the matching object). Does that make sense? 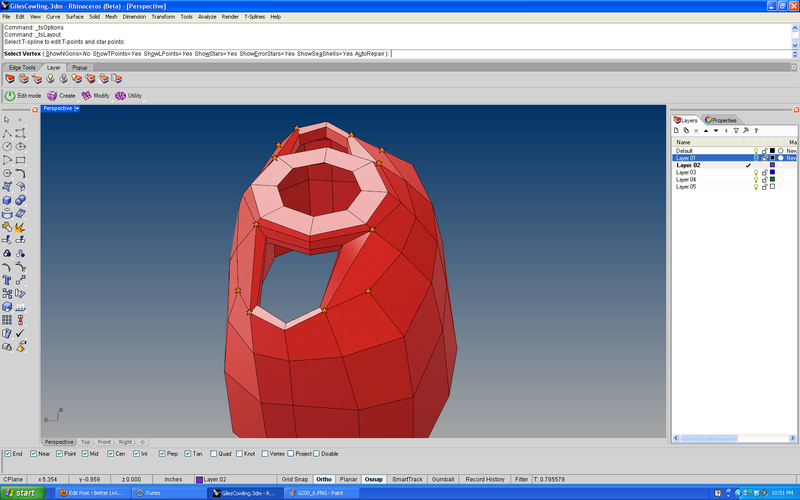 Maybe the whole spinner ring, or washer-like surface, is NURBs? Not quite seeing why it would be useful here to match a tSplines surface instead of, maybe, using tsMerge or welding. I think of tSplines surfaces as being made out of “bubble blow,” the soapy stuff we used as kids to blow bubbles out of a wire ring. What appeals to me about tsMatch is its apparent ability to impose (force) a machined, fixed surface onto a fluid changeable tSplines surface. 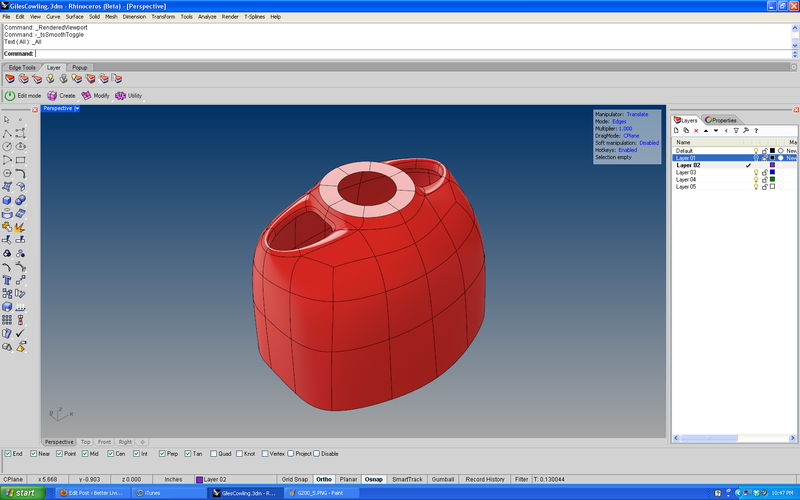 I did a model airplane cowl in tSplines, just using a hexagon to make a circle. Eventually, as I continued to work with it, it wandered out of round. In the end I converted to Rhino and cleaned it up with Trim. 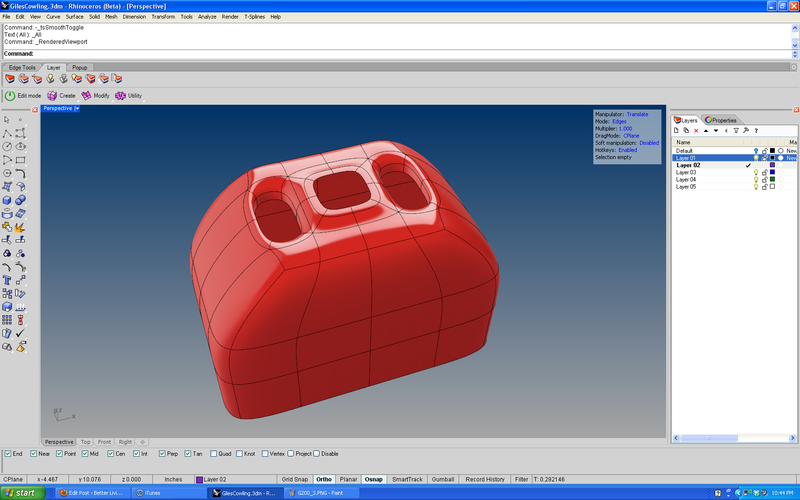 I am currently trying to model a transmission case. The original was cast and then machined. The tsMatch seems like the perfect tool for handling the machined surfaces. Can’t use good old Trim. In the early versions of tsplines, I could never get tsMatch to actually work, so I sort of set it aside. It appears that in the current versions, it works great. The whole point of using tsMatch is to make the spinner ring round – or very nearly as close to it as it can be. Since the whole thing is a degree 3 surface, all the surrounding geometry acts to pull the spinner ring out of true. tsMatch is simply the quickest and easiest way to get it back to circular. Thanks for this help. I am encouraged to get back into tSplines and try this technique. The pattern is, I try tsplines for a while, hit the wall — give it up for a few months — and then go back and try it again. 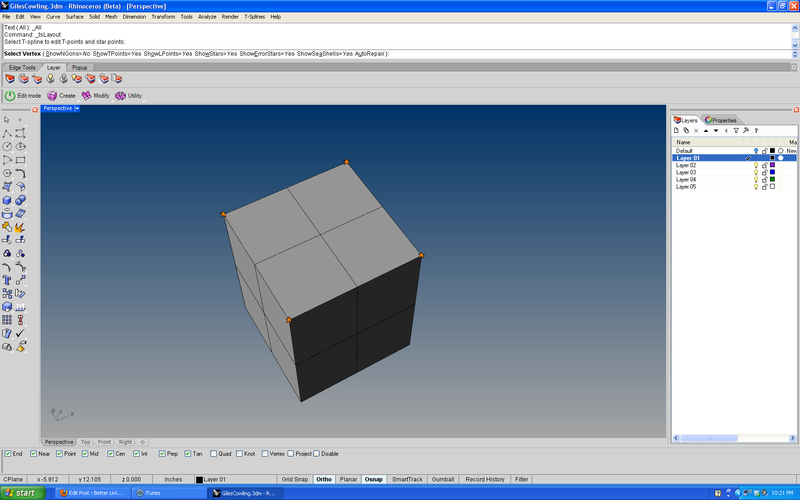 This one, I made first in Rhino, then converted it to tSplines to edit, and then converted it back. The transmission project, which has a very similar set of problems, is here. In both case you have a very precisely machined metal surface surrounded by, in essence, melted cheese. 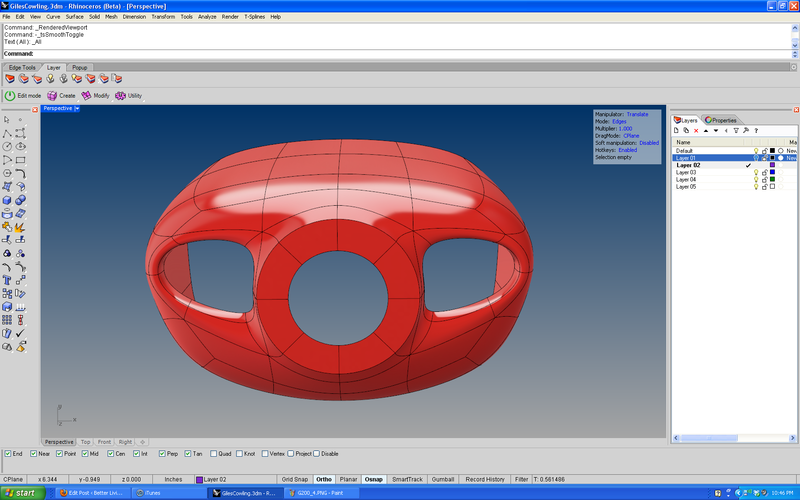 I’ve just started to use TSplines and I’m currently trying to work through your cowling tutorial. Can I ask the method you used to make the raised section of the spinner ring? I can seem to get it to work. I have removed the four faces etc but then get stuck. Any help would be appreciated.